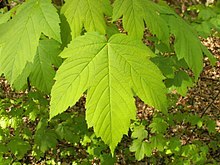 Acer est genus plantarum florentium familiae Aceracearum, quod circa 200 species comprehendit. Genus in Sina, Iaponia, Europa et America Septentrionali ortum est. ↑ P. F. Stevens, (2001+). Angiosperm Phylogeny Website. Version 9, June 2008 [and more or less continuously updated since]. http://www.mobot.org/MOBOT/research/APweb/. Novissima mutatio die 22 Martii 2013 hora 16:30 facta.